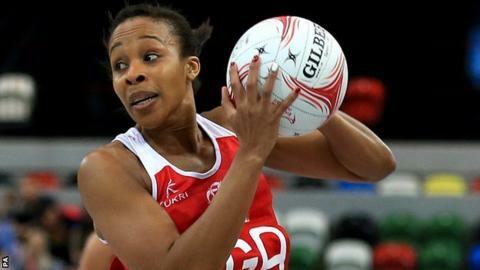 England shooter Pamela Cookey has retired from international netball with immediate effect. The 31-year-old is England's most capped attacker, having made 114 appearances over 11 years. She captained the team to World Cup bronze in 2011 but was moved to vice-captain for this year's tournament, where they finished third. Cookey will continue to play in the Superleague - England's domestic league - for Surrey Storm in 2016. "I've really loved wearing the red dress and I hope I have been able to give back as much as I have received to the sport," she said. Cookey claimed two bronze medals at the Commonwealth Games in Melbourne 2006 and Delhi 2010, but missed last year's event in Glasgow after rupturing her Achilles. She returned from injury to earn her 100th cap in the tri-series against Trinidad and Tobago in May, and went on to feature for Tracey Neville's bronze medal-winning side at the World Cup in Sydney in August.